Do you use wp-calypso? Leave a review! Calypso is the new WordPress.com front-end a beautiful redesign of the WordPress dashboard using a single-page web application, powered by the WordPress.com REST API. 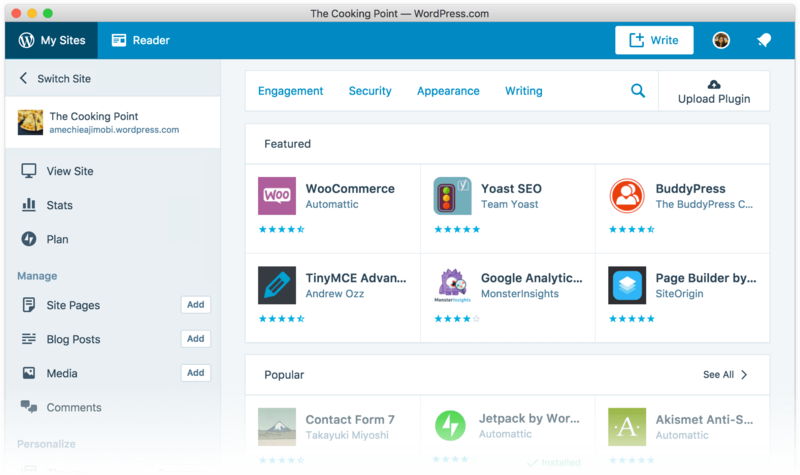 Calypso is built for reading, writing, and managing all of your WordPress sites in one place. You can read more about Calypso at developer.wordpress.com/calypso. You can try out the user-side of Calypso on WordPress.com (a lot of the logged-in area is Calypso; if in doubt, view source), you can poke around the code here on GitHub, or you can install it and run it locally. The latter is the most fun. Make sure you have git, node, and npm installed. Add 127.0.0.1 calypso.localhost to your local hosts file. Execute npm start from the root directory of the repository. Open calypso.localhost:3000 in your browser. Need more detailed installation instructions? We have them. If Calypso sparks your interest, dont hesitate to send a pull request, send a suggestion, file a bug, or just ask a question. We promise well be nice. Just dont forget to check out our CONTRIBUTING doc it includes a few technical details that will make the process a lot smoother. Calypso welcomes and indeed has been built by contributors from all walks of life, with different backgrounds, and with a wide range of experience. We're committed to doing our part to make both Calypso and the wider WordPress community welcoming to everyone. You can contribute in many ways. You can help reporting, testing, and detailing bugs, and also test new features we release in our beta program for testing on Horizon. To clarify these expectations, Calypso has adopted the code of conduct defined by the Contributor Covenant. It can be read in full here. We support the latest two versions of all major browsers, except IE, where we currently only support 11 and Edge. (see Browse Happy for current latest versions). If you have any problems running Calypso, please see most common issues. Calypso is licensed under GNU General Public License v2 (or later). over 2 years SEO - Jetpack: do not display verification tools (meta tag) is module is not active. Stats: Do not show no post on record when loading post details. Update <Site> component to use ES6 syntax. Sites: fix placeholder showing fading effects for overflow text. Accessibility: Make edit permalink feature keyboard-accessible. Sites: lift sites limit threshold. Signup: Headstart: Pass the current locale to Headstart. Editor: remove post-editor/pages feature flag. Checkout: Thank you page is feature aware. Signup: Fix autosuggest for usernames in Headstart flows. Themes: Add theme download in sheet view. WPCOM Plugins: All My Sites view for users with only WordPress.com sites. Posts: display user's gravatar in author segmented control. Signup: Properly suggest non-taken usernames when signing up. CurrentPlan: display purchase details like expiration date. Reader: Remove the header from the search stream. Terms: add request tracking to terms and QueryTerms component. Signup: Allow optionalDependencies to be set for steps. Add: use "non preview" url for external open of theme demo site. Stats: update Most Popular component to use QuerySiteStats. Site: track a few more granular stats. Stats: update all-time component to use QuerySiteStats. Signup: Improve the `developers` signup flow for simplicity and speed. Themes: use "Activate this design" for logged in users. Signup: Add an AB test for offering a Pressable store option. Signup: Add a `design-store` step that offers an e-commerce option. Devdocs: fix display of plan items. Terms: move TermTreeSelector, add devdocs example. Domains Search: Improve the way `PremiumPopover` component handles mouse events. Posts: use CPT component to render drafts. Editor: fix warning on clicking post delete button. Theme Sheets: added "hiding" class to hide content with a highly specific CSS class. Purchases: Add survey to refund flow. Revert "Limit SEO preview to business plan sites"
Site Selector: add reference to how many hidden sites there are. Domains: Update example state to be more helpful. WIP: NUX: Enter CC info while "Waiting to set up site"
My-Sites: Display better support options about themes for paid users. PostStatus: use the yellow color for pending review. [WIP] Google Apps provisioning page. Account Recovery: Add the lost password page. Add new AB test for removing G Suite from the signup flow. Fix bad code style found in Suggestions. Reader: Add in better post permalink tracking. IE/Edge fix for React15 onChange error. IE11 fix for Search overlay scrolling issues. Remove ColdStart v3 A/B test for newly signed up users. Masterbar: Add label to Post button on large screens. TermFormDialog: update validation to not allow duplicate term names. Add: lastQuery reducer and selector. Add initial prototype for front-end navigation block. Stats: Add all-time summaries for Countries. Stats: Remove unused stats-lists from site page. Jetpack Settings: Update items reducer state traversal method for Jetpack modules when syncing with Jetpack settings. Stats: Remove Sticky Tab Logic. [WIP] WooCommerce: Add variation editing UI. Add Domain Connect components for G Suite and Zoho Mail. Checklist: Remove the About page tour. Store: use data layer for email settings. JPO: display empty string in form fields instead of `false` when no data is present. Checklist: Banner should be updated when a task is completed. NestedSidebar: Demo of route:component mapping. jsconfig: Update excludes (again) to quiet the VS Code "exclude large folders" warnings. Revert "Update the wpcom-proxy-request package to v5.0.0"
Layout: Stop elements from the primary section from showing through the sidebar. Store: Remove hard-coded fees from settings page. PostRevisions. Only show revisions with changes of at least 5 words in the revisions history. package.json: Bump `notifications-panel` to v2.1.6. Plans: move HappinessSupport option to a card and style the new header. Keep up with changes to wp-calypso! Would you tell us more about wp-calypso?